Whew, it’s been awhile since my last post! 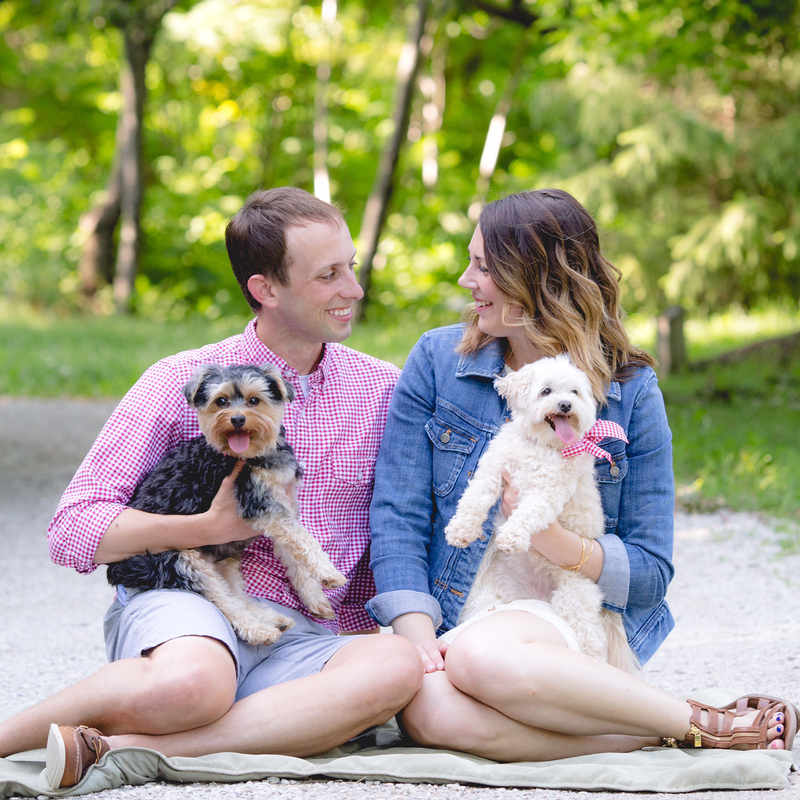 I know I say this all the time, but I’m working on carving out more time for blogging on a weekly basis because I do really enjoy using this space to share tidbits of our family life as well as everything else that inspires me – fashion, home decor, travel, etc. If there’s anything you want to hear more about, please let me know! I love hearing from you guys and the feedback really pushes me to write more frequently and lets me know what you want to read about! 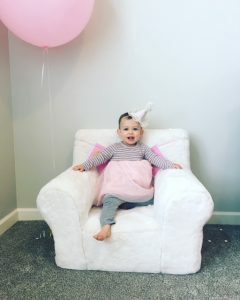 We celebrated our big one year old last weekend and I wanted to share a few pictures from her special day! 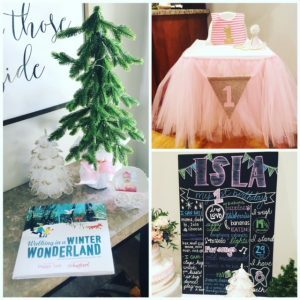 We decided on a winter ONEderland theme because it’s January in Nebraska, duh. 🙂 The snow held off until after her party, but an actual winter wonderland is exactly how I would describe what happened the following day here in Omaha. Don’t blame us for the blizzard – haha! Decorations: Isla has been obsessed with all of my little reindeer around the house I put out for Christmas, so I knew I wanted to incorporate some reindeer / woodlands into her birthday theme. Choosing a seasonal theme meant we were able to reuse other Christmas decorations and keep the tree up a little longer than usual! We also picked up a few little extras during the after Christmas sales. 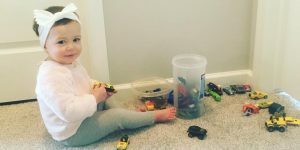 Most of the trees on her dessert table came from Pottery Barn Kids, which I scored for 60% off and can use for Christmas decorations next year. My mom covered the red burlap at the base of the light-up trees with white tissue and pink ribbon to match Isla’s favorite colors. I got her highchair tutu, and bib from Amazon, hat from MudPie and her outfit from Etsy. I made her poster board using foam board and Sharpie paint markers from Michaels. 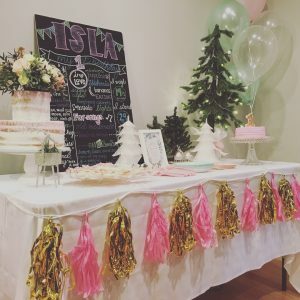 We decorated the entry table with more trees and had guests sign a hardcover book, “Walking in a Winter Wonderland,” for Isla to look back on and read the birthday wishes from her first birthday party. Desserts: The cakes came from Cake Creations in Omaha and they tasted just as good as they looked! 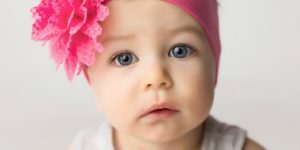 Side story – Isla had her first birthday photos taken a few weeks ago and being the procrastinator I am, I didn’t even think about ordering a smash cake for her photos until the day before. I called Logan freaking out (because I knew she’d be scarred for life if she didn’t have a smash cake at her photoshoot, haha!) and he found the phone number for Cake Creations on Google. I called in a panic and asked if they could make something for the next day and they were SO great! They made a beautiful hot pink jumbo cupcake with a gold “one” and it was more perfect than I ever expected and it tasted soooo good, too! I knew I wanted to use them for her birthday party cake, too, and they didn’t disappoint! My mom ordered the flowers for the cake topper from a little shop in my hometown (Blossoms Floral) and she made her famous sugar cookies to serve to the guests, too. Isla loved her cake and went to town on it as soon as I set it in front of her! I didn’t know how she’d handle being the center of attention, but she really hammed it up and loved being the star of the day! 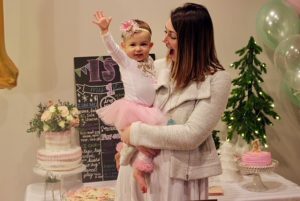 My mom has been teaching her to raise her hands up when we ask, “How big is Isla?” and she mastered it just in time for her party. Food: For the food, we kept things simple and served homemade soups (which fit in perfectly with our winter ONEderland theme) and picked up rolls, a veggie tray, chips and dip from Costco. 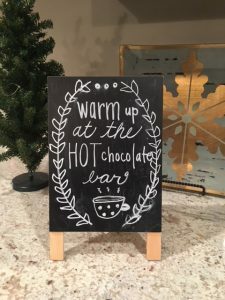 I also set up a hot chocolate bar for Isla’s guests to enjoy and “warm up” from the cold. 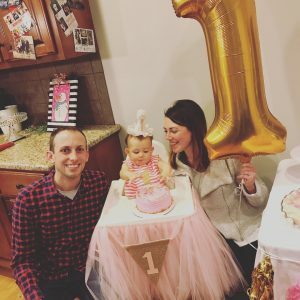 Overall, it was a wonderful day celebrating the first year of Isla’s life and our first year as parents. We are so thankful for all of the friends and family who have supported us this year and made Isla’s year so special. Thank you!